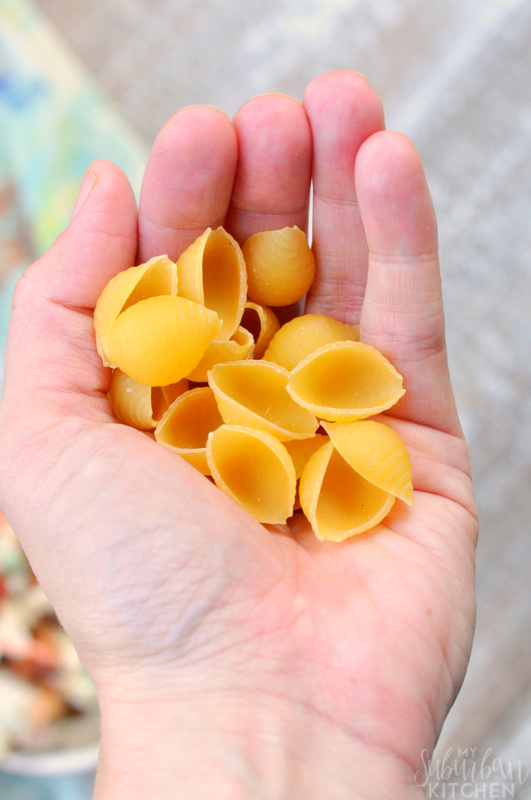 I usually make bowtie pasta salad but for this version I decided to use shells instead. The shape is absolutely perfect for letting all the delicious creamy dressing get into every nook. 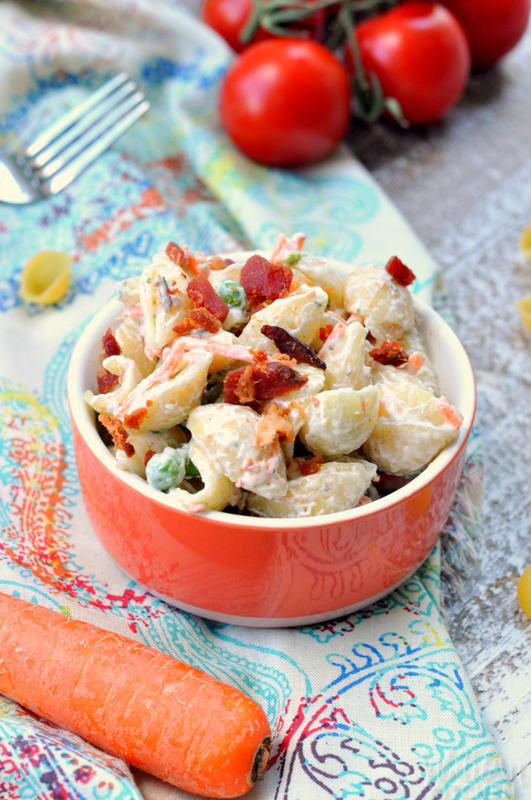 One of my favorite cold pasta recipes has always been the ranch pasta salad from the box you get at the grocery store. 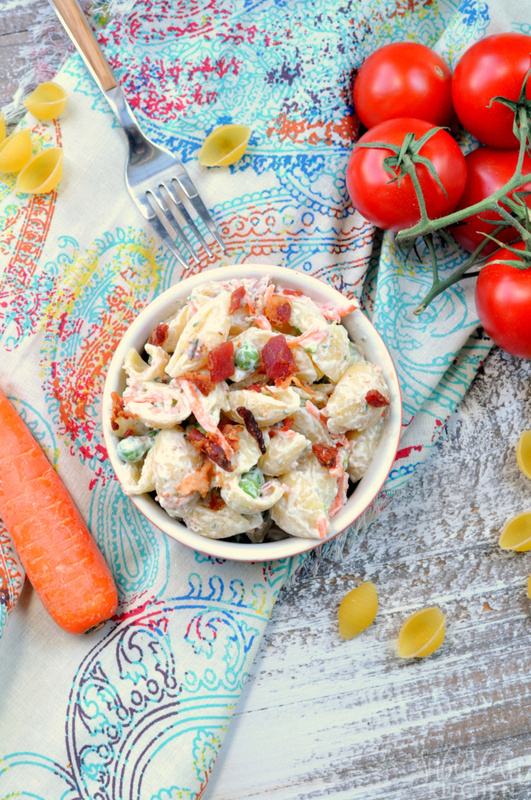 I knew I could make a copycat recipe that would be even more delicious so I made it my mission to create an amazing bacon ranch salad recipe. 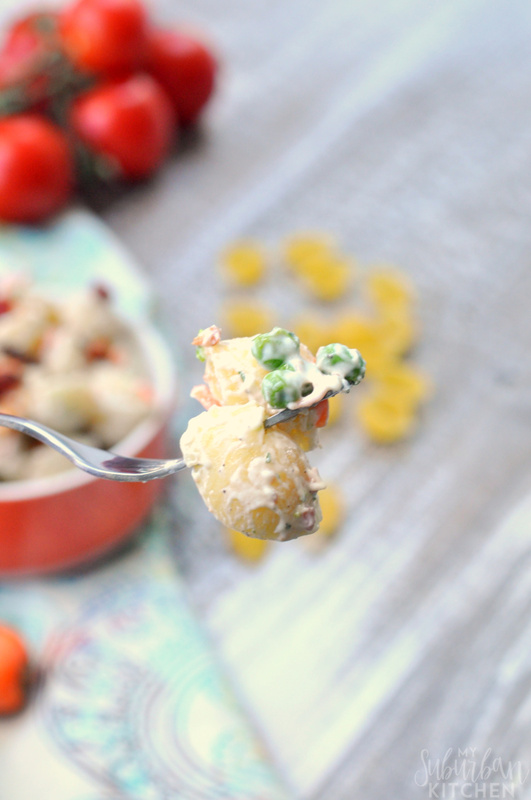 One of the main ways this creamy pasta salad recipe differs from the boxed version is that the vegetables aren’t dehydated so they have a lot of flavor. I do keep the recipe easy though by using pre-shredded carrots and frozen peas that are simply thawed/cooked by placing them in the pasta for the last few minutes of cooking time. 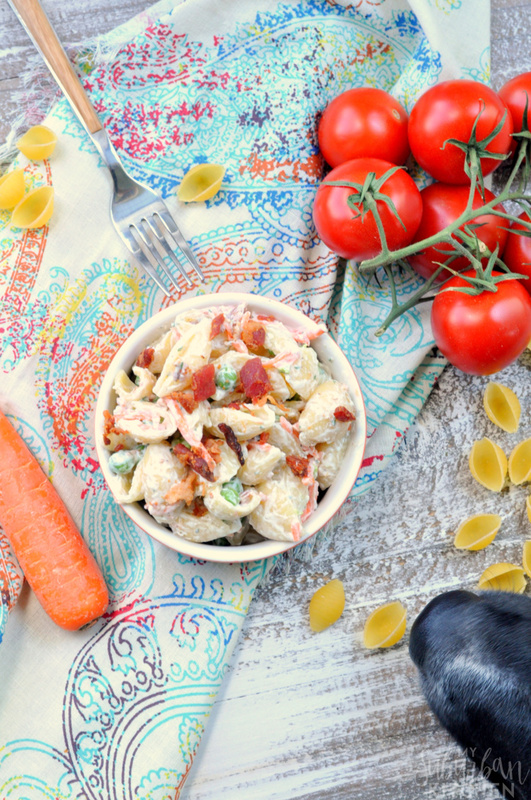 The result is a creamy pasta salad that no one (especially my 4 legged assistant) can resist! You can see she was trying to snag a bite even while I took the pictures. I know a lot of people tend to add tomatoes to their cold pasta recipes but I chose to leave them out of this recipe. If you are a tomato lover, definitely toss in a few quartered grape tomatoes for a burst of flavor. No matter what you add, you can’t forget the bacon! For the dressing, I tried to lighten it up a bit while still keeping this a super creamy pasta salad by using Greek yogurt in place of the traditional mayonnaise. If you prefer mayonnaise, you can easily replace the yogurt with it or use a combination of the two. 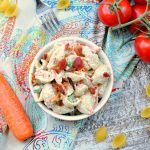 If you make this bacon ranch pasta salad recipe or any other recipe from the blog, I’d love to hear about your experience. Let me know in the comments or snap a photo and tag it #MySuburbanKitchen on Instagram or Twitter. 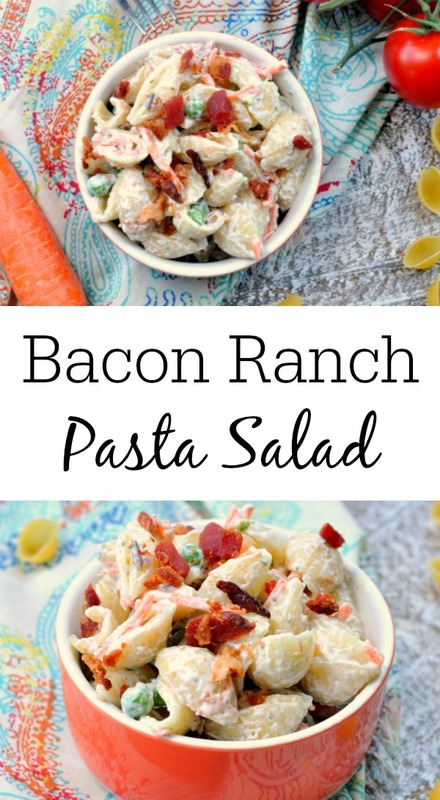 Bacon ranch pasta salad is a delicious and super easy cold pasta recipe that is perfect for any occasion: from BBQs to picnics. Bring a large pot of water to boil over high heat. Add 1 Tbsp salt and pasta. Stir and boil for 6 minutes. Add frozen peas and shredded carrots and boil for an additional 2 minutes. Drain well and transfer to large serving bowl. In a medium bowl, whisk together ranch dressing, sour cream, Greek yogurt, salt and pepper. Stir into hot pasta. Stir in half of bacon. Cover and refrigerate for at least one hour. Top with remaining bacon before serving. Bacon Ranch is one of my most favorite flavor combos! I cannot wait to try this salad! What an awesome side dish! I’ll have to make it for my cookout this weekend!